Bessie Smith (July, 1892 or April, 1894 – September 26, 1937) was the most popular and successful female blues singer of the 1920s and 1930s, and an important influence on subsequent singers, including Billie Holiday, Mahalia Jackson, Nina Simone and Janis Joplin. Smith's wrenching blues expressed the harsh realities experienced by the black underclass in the Jim Crow era. A pioneering artist and leading figure of the Harlem Renaissance, Smith defied racial barriers through the force of her indomitable personality and self-confident artistry. Joining the touring company of the legendary Ma Rainey, Smith emerged as a formidable blues singer at a time that coincided with the birth of the commercial recording industry. Smith's "Down-Hearted Blues" (1923), recorded two years after Mamie Smith's ground-breaking "Crazy Blues," broke sales records and helped convince recording executives that jazz and blues, so-called race-music, was a viable commercial enterprise. Smith, and above all cornet player Louis Armstrong, ushered in the Jazz Age, an era that introduced African American music to mainstream America. The Smith-Armstrong sessions are considered classic collaborations of two pioneering musicians at the peak of their artistic powers. Smith's notorious private life contributed to the glamorizing of self-destructive behavior often associated with jazz, blues, and rock performers to the present day. Smith's drinking, violent temper (and physical strength), and predatory sexual life involving both men and women were boundary breaking, even by the standards of free-living musicians of the Roaring Twenties. A number of Smith's recordings in her later career were frankly pornographic, reflecting both her loss of stature as an artist and her first-hand experience in reckless and often abusive relationships. Smith was also known for her generous and charitable acts, giving away much of her new-found wealth and paying hospital bills of friends, and she remained devoted to her adopted child throughout her life. Her entire Columbia Records catalogue has been reissued and she was inducted into the Rock and Roll Hall of Fame in 1989. Bessie was the daughter of Laura (Owens) Smith and William Smith, a Baptist minister. For the 1900 census, Bessie Smith's mother reported that Bessie was born in Chattanooga, Tennessee, United States in July, 1892. However, for the following census (1910), her sister, Viola Smith, reported the date as April 15, 1894. It was the later date that was observed by Bessie and her family and which appeared on all subsequent documents. While there is no reason for Bessie Smith to alter the date of her birth, the year is a different matter with some reports citing her year of birth as 1896 and 1898. Due to the unreliability of early census figures and sometimes incomplete biographical interviews, the size of Smith's family remains the subject of serious debate. However, most believe her to be one of seven children; her eldest brother, Bud, dying before she was even born. Smith lost her father soon after her birth and her mother passed when she was eight. Since both of her parents were deceased the care of Bessie and her other siblings fell to her older sister Viola. As a way of earning money for their impoverished household, Bessie and her brother Andrew began performing on the streets of Chattanooga as a duo, she singing and dancing, he accompanying on guitar; their preferred location was in front of the White Elephant Saloon at Thirteenth and Elm streets in the heart of the city's African-American community. In 1904, her oldest brother, Clarence, covertly left home by joining a small traveling troupe owned by Moses Stokes. "If Bessie had been old enough, she would have gone with him," said Clarence's widow, Maud, "that's why he left without telling her, but Clarence told me she was ready, even then. Of course, she was only a child." Bessie's turn came in 1912, when Clarence returned to Chattanooga with the Stokes troupe and arranged for its managers, Lonnie and Cora Fisher, to give her an audition. She was hired as a dancer rather than a singer, because the company also included Ma Rainey. Bessie traveled with the troupe across the South for several months, but left the troupe to join Irving C. Miller's tent show. The following year however she was forced to leave Miller's show because she was considered to be too dark. She then moved on to the 81 Theater in Atlanta and then Park's Big Revue at the Dixie Theater. In 1915 she rejoined Ma Rainey this time in Fat Chappelle's Rabbit Foot Mistrels, continuing to travel with various minstrel shows through 1916. It was not until 1918 when she had the opportunity to star in her own show, Liberty Belles Revue in Atlanta, Georgia, in which she appeared as a male impersonator. She then moved up the East Coast playing shows in Atlantic City before settling in Philadelphia where she work in Horan's Madhouse Club from 1920-1923. It was in 1923 when she appeared in the musical comedy How Come being staged at the Dunbar Theater in Philadelphia. Later that year, however, Smith signed a recording contract with Columbia where her first single, "Down Hearted Blues" sold a record-breaking 780,000 copies. She followed that success in 1925 with W.C. Handy's song "St. Louis Blues," which she recorded with Louis Armstrong. In addition to her recordings Smith became a headliner on the black Theater Owners Booking Association (T.O.B.A.) vaudeville theater circuit and was its top entertainer in the 1920s. Her popularity with black and white audiences alike led her to be deemed the "World's Greatest Blues Singer" and eventually the "Empress of the Blues," and led her to earn hundreds of thousands of dollars. Smith recorded 160 songs while with Columbia Records, until in 1931, the effects of the Great Depression made it difficult for the record company to survive. However, Smith continued to tour with her own show The Bessie Smith Revue until her tragic death in 1937. In 1929, Bessie Smith made her only film appearance in an adaptation of the song "St. Louis Blues." Smith, who recorded the song four years earlier, was chosen for the role by the song's composer W.C. Handy, who was also a collaborator on the film. In the film she played the scorned and beaten lover of a handsome gambler who leaves her for a lighter-skinned woman. The film has drawn much contemporary criticism for its use of racist and sexist stereotypes. But beyond that many have commented on the films inability to capture the same spirit of Smith's recording of the song. While the film outlines the same events that are related in the song's lyrics, without Smith's vocal interpretation the emotion and power of the female is not fully communicated in the film. 1929 also saw Smith's Broadway debut in Marceo Pickard's Pansy. However, due to limited rehearsal time, an inexperienced producer, and the show's subject matter (it dealt with college activities), the show was a flop. After receiving terrible reviews it closed after only three days and did more harms to Smith's career than good. Being a black artist in the 1920s and 1930s led Smith to face situations that equally successful white artists did not encounter. This included Columbia having to buy her a personal train car because she was not permitted in the 'whites only' first-class car. Smith's brother Clarence suggested the railroad car in 1925. It was custom made for Bessie by the South Iron and Equipment Company and with two stories, seven staterooms that slept four, a kitchen, and a bathroom it was large enough to comfortably hold everyone in her show. It was also recognizable; painted bright yellow with green lettering everyone knew when Smith's show came to town. Also, in July 1927 robed members of the Ku Klux Klan appeared at one of her tent performances and began to pull up the tent stakes. When Smith heard of what was happening she left the tent and confronted the men shaking her fist at them and ordering them to "… pick up them sheets and run!" After continuing to curse at them the KKK members left and Smith returned to her performance. Bessie Smith was married twice. Her first marriage was to Earl Love in 1920, which ended a year later when he died. Smith married three years later, this time to Jack Gee. Smith's love and admiration for Gee was stirred during their first date when he was attacked by an "unknown assailant." Smith visited him every day in the hospital for five weeks and moved in with him after his release. The two married shortly after and remained together for six years which were marked by affairs, arguments, and violent fights. While Gee took credit for managing Smith's tours and for writing some of the songs Smith recorded and performed, it is now believed that his role was minimal, and that Smith wrote the songs herself. However, because of Smith's love for Gee and his violent temper, those that were part of the show were terrified of him and allowed him to take credit. In an attempt to save their marriage Smith adopted a six-year-old boy; the son of one of Smith's chorus girl's niece. They renamed the boy John Gee, Jr. and Smith took great pride in spoiling him. However, because of her constant touring Smith was unable to take care of John, Jr. daily. Therefore she bought two houses for her sisters in Philadelphia with the understanding that they care for her son while she was away. When Gee and Smith finally separated in 1929 because of his infidelity with Gertrude Saunders, a performer like Smith, Gee decided to hurt Smith by using their son. One day when Smith was not at him he told John, Jr. to get in his car and then drove him to the Society for Prevention of Cruelty to Children (SPCC) and reported that ten-year-old John, Jr. was allowed to stay out all night and that he refused to go to school. John, Jr. eventually escaped the SPCC only to be placed in Gee's care where Gee and Saunders forced him to live in the basement. After losing both Gee and her son, Smith was left heartbroken, but did become involved with Richard Morgan, a Chicago bootlegger, before her death. In addition to these heterosexual relationships Smith almost certainly engaged in relationships with Lillian and Marie, two female dancers from her show, and others. However, it was her relationship with Ruby Walker, Gee's niece, which was the most intensely emotional. While many of Smith's biographers believe her affair with Walker to be purely emotional, Walker's interviews with biographer Chris Albertson, prove the relationship to have been sexual as well. However, while Walker was loyal to Smith and protected her from Gee, she too often tried to take advantage of Smith's fame. During one of Smith's recording sessions Walker spoke to the producer, as Smith sang, about the possibility of recording some songs herself. Smith, suspicious of Walker, immediately interceded and order that Walker not be allowed to record. But despite their arguments they remained loyal to one another until Smith's divorce from Gee, when Walker left Smith, claiming that she was terrified of what Gee would do if she remained on tour with Bessie. In addition to Smith's open bisexuality she also had a reputation for heavy drinking and lewd behavior. One particular incident occurred when Smith was leaving a party at the home of Carl Van Vechten, a wealthy journalist from Manhattan. Van Vechten's wife attempted to embrace Smith as she exited at which point Smith cursed at her and knocked her over. Smith's violent behavior and hard drinking also led to her being stabbed as she left a party by a young man she pushed aside at a party. On September 26, 1937, Smith was severely injured when, while traveling along U.S. Route 61 between Memphis and Clarksdale, Mississippi with Richard Morgan at the wheel, their car struck a National Biscuit Company truck that was parked without lights. She was taken to Clarksdale's black Afro-American Hospital where her right arm was amputated. She did not regain consciousness, dying that morning. For some time it was believed that Smith's died as a result of being refused admission to a "Whites Only" hospital in Clarksdale. The myth, which is now discredited, began when jazz writer/producer John Hammond wrote an inaccurate article that appeared in the November 1937 issue of Down Beat magazine. The article went on to be the basis for Edward Albee's 1959 one-act play The Death of Bessie Smith. Smith's insurance policy ensured that she would have a large funeral. Her five-hundred dollar casket was trimmed with gold and lined with pink velvet. There were more than 40 floral arrangements and thousands lined the streets of her hometown as she was laid to rest eight days after her death. Yet despite all of this her grave was left unmarked. Gee, who inherited all of her money, and the rest of her family did not buy her a headstone. In 1948 a Bessie Smith Memorial Concert was held to raise funds for a stone but according to Smith's sister Maud, Gee pocketed the money. The same happened again in the early 1950s when a benefit was held at the Blue Note Club in Philadelphia. Maude Smith reported that she gave a check to Gee with the understanding that the two would choose a stone together, but she never heard from him again and no stone was ever purchased. However, in August 1970 Juanita Greene, President of the North Philadelphia chapter of the NAACP and Janis Joplin purchased a gravestone for Smith that read "The Greatest Blues Singer In The World Will Never Stop Singing." It had been Greene's mother who had served as a housekeeper for Smith. Given the technical faults in the majority of her original gramophone recordings—especially variations in recording speed, which raised or lowered the apparent pitch of her voice, misrepresented the "light and shade" of her superb phrasing, interpretation and delivery, and altered the apparent key of her performances (sometimes raised or lowered by as much as a semitone) and, also, the fact that the "centre hole" in some of the master recordings had not been in the true middle of the master disc, meaning that there were wide variations in tone, pitch, key and phrasing as the commercially released record revolved around its spindle—there is a very significant and very positive difference in the performance that Smith delivers in the current digitally remastered versions of her work. At the height of her popularity Bessie Smith sold more records and earned more money than any other blues performer.Smith's rising popularity brought her to New York, where she performed with jazz greats including Fletcher Henderson, James P. Johnson, and Coleman Hawkins. The confluence of great jazz musicians and arrangers, preeminently Duke Ellington, and such writers as Langston Hughes, James Weldon Johnson, and Zora Neale Hurston, came to be known as the Harlem Renaissance. Smith's subject matter was key in defining her songs and style. Always focusing on the female perspective of African American life Smith recorded songs about abuse, lost lovers, female rivalry and jealousy, voodoo, and race relations. Her grassroots and traditional black sound cost her early record contracts but ultimately earned Smith her success and helped to create a bridge between former and contemporary black identity. In a time when black women were consigned to, at best, domestic work, Smith brought a strength and understanding to their shared experience. Smith unapologetically redefined the blues and it was the strength just below the sadness of her songs that would influence later singers like Billie Holiday, Aretha Franklin, and Janis Joplin. 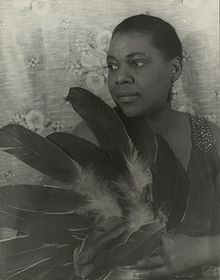 In 1989 Bessie Smith was inducted into the Rock and Roll Hall of Fame under the category of Early Influence. ↑ Paul Oliver, "Bessie Smith" in The New Grove Dictionary of Jazz, 2nd Edition, Vol. 3, edited by Barry Kernfeld. (London: MacMillan, 2002), 604. Albertson, C., Liner notes, Bessie Smith: The Complete Recordings, Volumes 1 - 5. Sony Music Entertainment, 1991. Albertson, C. Bessie. New York: Stein and Day, 1972. Albertson, C. Bessie, (Revised and Expanded Edition), New Haven: Yale University Press, 2003. ISBN 0300099029. Albertson, C. Bessie Smith, Empress of the Blues. New Haven: Schirmer Books, 1975. Brooks, E. The Bessie Smith Companion: A Critical and Detailed Appreciation of the Recordings. New York: Da Capo Press, 1982. Davis, Angela Y. Blues Legacies and Black Feminism: Gertrude "Ma" Rainey, Bessie Smith, and Billie Holiday. NY: Pantheon Books, 1998. ISBN 067945005X. Contains 100 pages of lyrics recorded by Smith. Eberhardt, C. Out of Chattanooga. Chattanooga: Ebco, 1993. Feinstein, Elaine. Bessie Smith. NY: Viking, 1985. ISBN 0670806420. Grimes, S. Backwaterblues: In Search of Bessie Smith. Amherst: Rose Island Pub., 2000, ISBN 0970708904. Kay, Jackie. Bessie Smith. NY: Absolute, 1997. ISBN 1899791558. Manera, A. Bessie Smith. Chicago: Raintree, 2003. ISBN 0739868756. Martin, F. Bessie Smith. Paris: Editions du Limon, 1994. ISBN 290722431X. Moore, C. Somebody's Angel Child: The Story of Bessie Smith. NY: T. Y. Crowell Co., 1969. A children's book that is largely fiction. Oliver, Paul. Bessie Smith. London: Cassell, 1959. Welding, P., and T. Byron, eds.. Bluesland: Portraits of Twelve Major American Blues Masters. NY: Dutton, 1991. ISBN 052593375. Includes "T'Aint Nobody's Business If I Do" by Chris Albertson. This page was last modified on 4 June 2016, at 16:42.